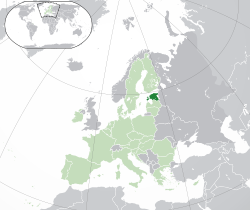 d. ୪୭,୫୪୯ କି.ମି.୨ (୧୮,୩୫୯ sq mi) were defined according to the Treaty of Tartu in 1920 between Estonia and Russia. Today the remaining ୨,୩୨୩ କି.ମି.୨ (୮୯୭ sq mi) are still occupied and part of Russia. The ceded areas include most of the former Petseri County and areas behind the Narva river including Ivangorod (Jaanilinn). Pechory remains under Russian control. ↑ ୪.୦ ୪.୧ ୪.୨ ୪.୩ "Estonia". International Monetary Fund. Retrieved 18 April 2012.